Cheap flights from Sofia to Auckland, New Zealand from €675! Another competitive deal from the UK to Buenos Aires these days this time based on service of Air France/KLM. Return flights from Birmingham, Inverness, Manchester, Glasgow, Newcastle. Leeds, Aberdeen or London (however from London we recommend Norwegian non-stop flights) are available from £425! Note that there is no checked luggage in base fare otherwise this is for a roundtrip including all taxes, onboard meals and max 12kg hand bag. Choose this option especially if you appreciate departures from other UK cities than just from London from where such a deals are more common these days.. If interested in this discount deal with Air France-KLM you will find the cheapest flights when departing from the United Kingdom to Buenos Aires, Argentina in May and June, September 2019 or January to March 2020. Min stay 5 days or return flight commences on Sunday. Max stay 3 months. No free stopover available. No bag in hold in base fare. Fare class Feeder / Intercontinental leg is “L , G“. Air France-KLM promo sale is running till 9th of May or until sold out..
You can book your accommodation in Buenos Aires, Argentinaa via Booking.com. Also you can further discount your hotel when using one of following promo codes. Buenos Aires (the official name ‘is Ciudad Autónoma de Buenos Aires/Autonomous City of Buenos Aires, also called Capital Federal/Federal Capital) is the capital of the Argentine Republic. The name means fair winds, or literally good airs in Spanish. It is one of the largest cities in Latin America, with a lot of cultural offerings, and is the point of departure for travelling to the rest of the country. Inhabitants of Buenos Aires are called porteños, “people from the port”, implying that many of the inhabitants are immigrants in some ways or another. Buenos Aires is a singular, open, and integrating destination that allows the visitor not only to view the city but also to have an exceptional urban adventure. If you will book these flights from UK to Buenos Aires with Air France/KLM you can read more about this city at Wikitravel. 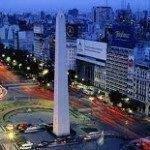 Booking sample of Air France-KLM flights from the UK to Buenos Aires, Argentina from £425! In this case you would depart from Inverness to this city in South America on 19th of May. Inbound from Buenos Aires back to United Kingdom on 3rd of June 2019.